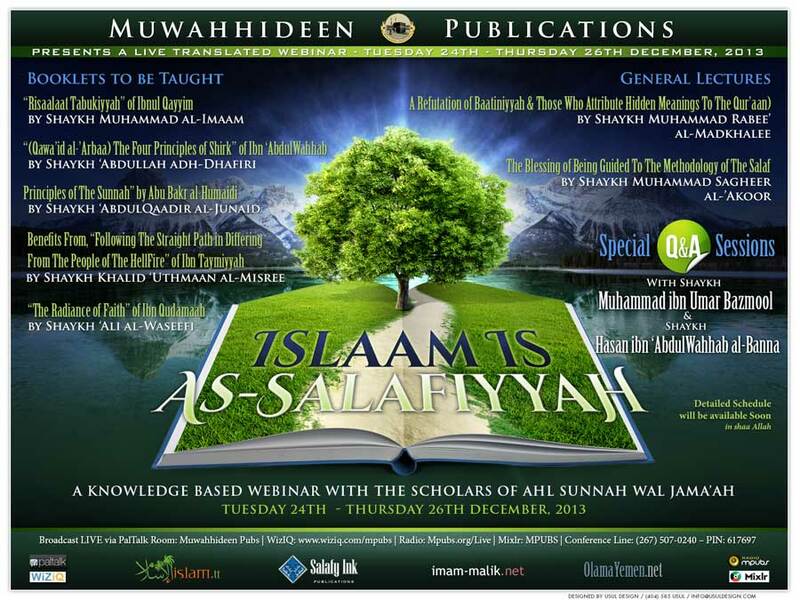 Muwahhideen Publications and Islam.tt in conjunction with Salafy Ink, Imam-Malik.net and Olamayemen.net are pleased to announce an intensive knowledge-based Webinar with The People of Knowledge from Tuesday 24th to Thursday 26th December 2013 entitled, “Islaam is as-Salafiyyah”. This event will be broadcast LIVE in Masjid Ibn 'Abbaas, Tobago, two masaajid in Trinidad, Masjid ul Khaleefah and Masjid us Sunnah, and five masaajid in the U.S .Masjid Al-Bukhaari, Florida, Masjid Ibn 'Abbas, Georgia, Masjid Nur Allaah, New York, Masjid as-Sahabah, Ohio and Masjid Tawheed, Michigan. Spend your holiday time wisely, in the pursuit of beneficial knowldege directly from the scholars of Ahl Sunnah wal Jama'ah!